FreshMarine.com - Murray River Turtle - Emydura m. macquarii - Buy Murray River Turtle Now and Save! The Emydura macquarii macquarii or the Murray River Turtle is an Australian chelid. They are most commonly found in the Murray-darling River Basin and their effluent streams and a few coastal rivers that run across the southern coast of Australia. Some isolated population has also been spotted in Queensland, Fraser Island and Cooper Creek System. The first part of its Latin name, Emydura, means fresh water turtle and the second part, macquarii, refers to the river Macquarie that they inhabit. Their carapace is oval and arched evenly across its medial length. The carapace is brown, slightly keeled and non-serrated. The shell might have a wrinkled appearance on the coastal and vertebral scutes and adults might have a flared carapace. The oval plastron is much smaller than the carapace and is hinged at one point. It is yellow with no pattern. In some Emydura macquarii macquarii the plastral scutes can be translucent and reveal the bones hidden under them. The Murray River Turtle has a small head with prominent bright pig-like snout and a pair of brightyellow eyes. A pair or yellow or white stripes run from the snout, across the mouth to throat and form a V-shape. The throat is covered with warts and nodules and a pair of barbels hangs under the chin. The Murray River Turtle primarily inhabit big rivers or fresh water bodies that originate from big rivers. Murray, Macquarie and darling rivers are the primary homes of the Emydura macquarii macquariibut a large number is also found in estuaries, oxbows, backwater lakes, anabranches and deep waterholes in plains. They avoid shallow water sources and prefer depth of more than 2 meters. They prefer deep, large clear water bodies with stable currents. The Murray River turtle can reach up to 13 inches carapace length. Ideally outdoor setups are recommended. Hobbyists are recommended to provide at least 200 gallon water tank to a full grown adult. There should be enough space in the aquarium for the turtle to easily move around. A basking platform that can support its weight should be fitted in the aquarium under a setup of UVB light and a heating lamp. These turtles are very sensitive and hygiene is utterly important. A dirty aquarium can lead a number of shell diseases and infection. A submersible water filter should be fitted in the aquarium that filters the complete volume of water in 90 minutes. The water temperature should be maintained around 25 to 30 degree Celsius. If left undisturbed and on minimum physical contact the Murray River turtles are calm and sober but they are known to inflict vicious bites on people who try to pick them or lift them. Minimum handling is recommended to avoid stress and aggression. 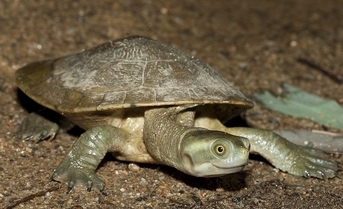 The Murray River turtles are essentially omnivores. The juveniles have a high protein requirement and prefer to eat flesh but as they age their inclination shifts to plants. Their diet is made up of water algae, aquatic plants, snails, worms, carrion and fish. In captivity you can feed them an assortment of insects and chunks of meat, beef or fish, romaine lettuce, hyacinth and other leafy vegetables. A healthy diet is recommended and a weekly dose of vitamin and powdered calcium should be fed to them mixed with their meals.